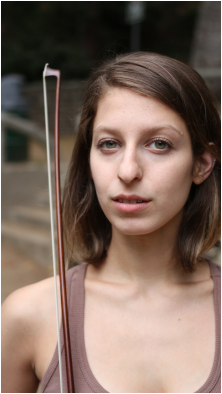 New York City based violinist Marina Kifferstein is an active freelancer and a full time member of the Nouveau Classical Project, TAK, and Tactus Ensembles. A strong supporter of new music, Marina has worked closely with many prominent composers, such as Pierre Boulez, Philippe Manoury, James Wood, Chaya Czernowin, Martin Bresnick, Julia Wolfe, and Rand Steiger, as well as a multitude of emerging composers. She was a founding member of the contemporary sextet Amusia, which held the position of Young Ensemble in Residence with the Detroit Chamber Winds and Strings in its 2011-2012 season. Her concerto solo debut was with the Dalton Orchestra in 2007 as winner of the Dalton concert competition. Since then, she has most notably performed the North American premiere of Hindemith’s Kammermusik No. 4 with the Oberlin Wind Ensemble, and is involved in a Spring 2014 performance of Berio’s incredible re-working of his violin Sequenza, “Corale,” with the Tactus Ensemble. She has performed solo, chamber music, and orchestra concerts across America and internationally, in venues such as the Walt Disney Concert Hall and Carnegie Hall, as well as across Switzerland, France, Italy, China and Singapore in venues such as the KKL Lucerne, La Salle Pleyel in Paris, the Beijing Concert Hall, and the Esplanade in Singapore. Marina has held fellowship positions at the Sarasota Music Festival, the Bang on a a Can Summer Music Festival, The Manchester Music Festival, the Institute and Festival of Contemporary Performances at Mannes, the Montreal Contemporary Music Lab, and the Lucerne Festival Academy Orchestra in Switzerland. Outside of the realm of performance, Marina is a contributor to the blog I CARE IF YOU LISTEN and was a staff writer for the Oberlin Conservatory Communications office in 2011-2012. She also holds a teaching position at the Long Island City Academy of Music, and teaches privately. This season marks the launch of Vox Hebraica, a concert series she founded and curates at the Actors’ Temple in NYC that focuses on broadening and expanding the public conception of the Jewish experience through diverse and dynamic programming. Along with her professional activities, Marina is currently pursuing a Masters degree in Contemporary Performance at the Manhattan School of Music, where she is the recipient of a full scholarship in the studios of Curtis Macomber and Laurie Smukler. She has played in master classes for world-renowned artists such as Pamela Frank, Mauricio Fuks, Aaron Rosand, Sylvia Rosenberg, and members of the Takacs and Emerson String Quartets, among others, and hols a BM in Violin Performance and a BA in English with Creative Writing Concentration from Oberlin College and Conservatory, whe she was a student of Milan Vitek.